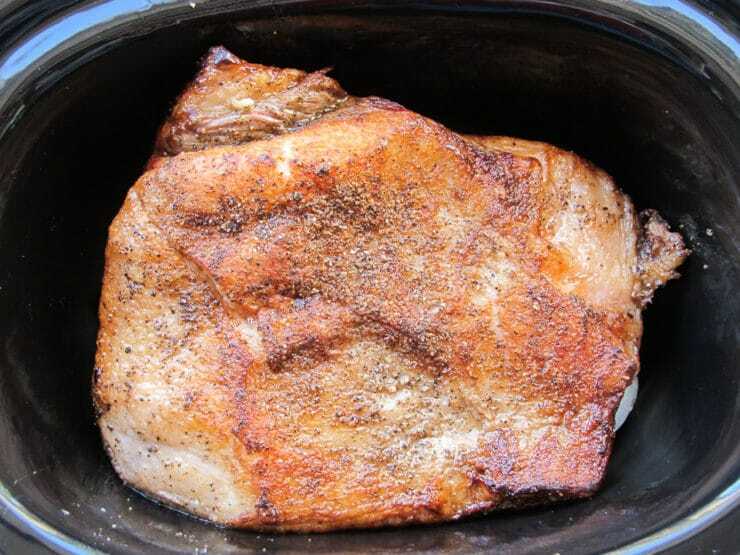 Savory Slow Cooker Brisket – Recipe with Video. Brisket Recipe with Onion, Garlic and Spices Made in the Crock Pot. Kosher for Passover. Step-by-step video below! Want to know one of my biggest prep secrets for making brisket during the holidays? Two words – SLOW COOKER, or CROCK POT, if you’re so inclined! With my stove and oven in overdrive, there is nothing better than having a brisket slowly cooking in the background while I deal with everything else. It frees up oven space, and the results are every bit as tender and delicious as brisket prepared in the oven. We usually cook brisket for Passover. For larger Seder meals we have hosted in the past, I have been known to plug in four slow cookers at the same time, borrowed from family and friends! Over time I learned to make a couple of briskets ahead– the flavor improves when the meat sits in the refrigerator for a day or two before serving. It’s also easier to slice cold, and reheating is a breeze. I’ve offered make-ahead directions below, as well as instructions for serving straight from the slow cooker. Either way, you will love this brisket… it is fork tender, flavorful, and juicy… everything a holiday brisket should be! For more Passover recipe ideas, check out my Passover Recipe Index, where you’ll find delicious inspiration for a variety of dietary restrictions, including Ashkenazi, Sephardic, Gluten Free, Vegetarian and Vegan diets. Brisket made in the slow cooker or crock pot with onion, garlic and spices made in the crock pot. Easy, tender, delicious! Kosher for Passover. 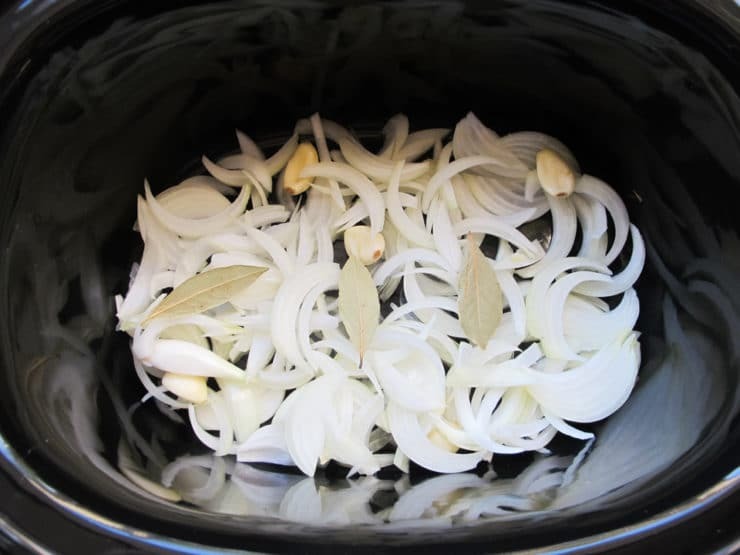 Place half of the chopped onions, 5 of the garlic cloves and the bay leaves in the bottom of the slow cooker. Rinse the brisket and pat dry. Sprinkle both sides of the meat lightly with black pepper and salt. 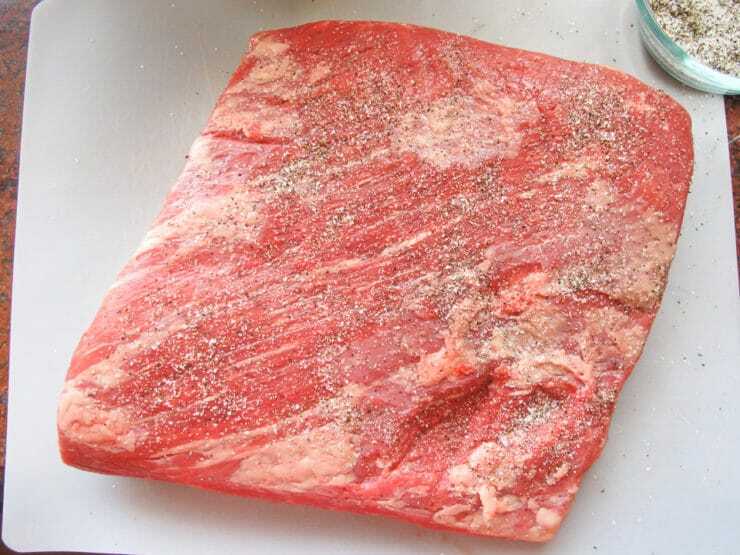 If you're using a kosher salted brisket, or if you are salt sensitive, skip the salting here -- there will be plenty in the sauce after cooking. Note about this next step-- if you're in a hurry you don't need to brown the brisket before placing it in the slow cooker, just mix the spices with the water and pour over the brisket in the slow cooker. However, if you do have time to brown it first the flavor will be much better! Drizzle 2 tbsp of olive oil into the pan and heat a large skillet over high heat until it just begins to smoke. Brown the brisket on both sides—it will take a few minutes per side. 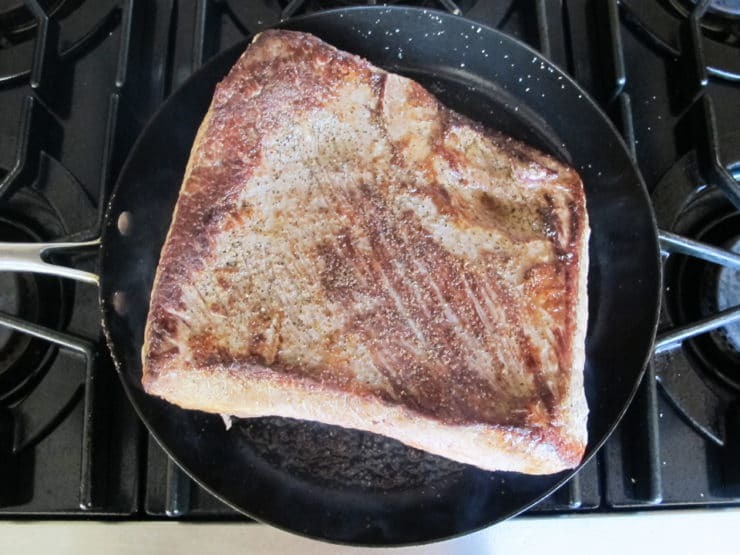 A large brisket may overlap the edges of the skillet; you can brown it in stages, letting half the brisket overlap the edge, then adjusting it to brown the other half. Make sure you get some nice dark brown bits on there, it really adds to the flavor. 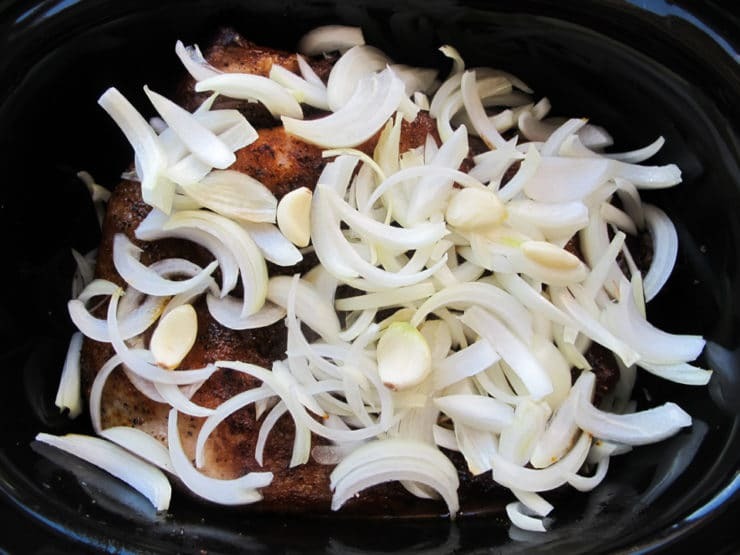 Once the brisket is browned, place it in the slow cooker on top of the onions and garlic. Drain the fat from the skillet, leaving behind any brown bits in the skillet. Return the skillet to the stove. In a small bowl, mix together the water, 1 1/2 tsp. kosher salt, black pepper, paprika, turmeric and cayenne. 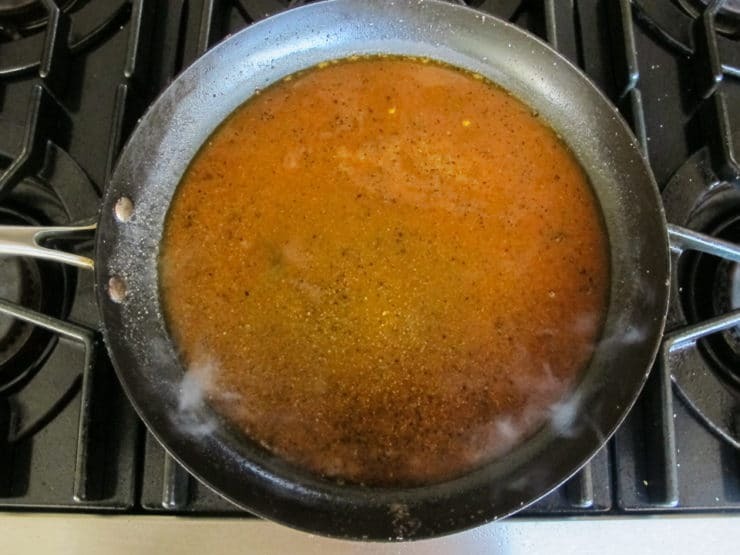 Pour the water and spice mixture into the skillet and heat over medium until hot and bubbly, using the liquid to deglaze the pan and loosening brown bits gently from the bottom of the skillet with a spatula. Pour the contents of the skillet over the brisket. Top brisket with the remaining sliced onions and garlic cloves. Cover and cook on low for 8- 10 hours, or until fork tender. Tenderness will increase as it cooks, so take it out when it's tender to your liking. Most people like it very tender but not so soft that it is falling apart. You want it firm enough to slice but tender enough that the edges shred with a fork. I recommend making this brisket ahead; allowing it to sit in the refrigerator for 1-2 nights will improve the flavor. If you would like to do this, skip ahead to where it says “Make Ahead Directions.” If you are not making ahead, continue reading. Remove brisket from the pan and let it rest on the cutting board fat-side up for 20-30 minutes. Meanwhile, skim fat from the surface of the cooking sauce. You may strain the sauce to separate the solids out and discard— if you do this, return the sauce to the slow cooker, mix together 1 tbsp potato starch or cornstarch (use potato starch for Passover) with 1 tbsp of cold water, and stir it into the strained liquid in the slow cooker. Alternatively, you may thicken the cooking sauce by first removing the bay leaves, then using an immersion blender to blend the sauce with the garlic and onions directly in the slow cooker (careful, the liquid is hot-- protect yourself with a towel and take care with more delicate ceramic slow cooker inserts). Once your sauce is ready, cut fat cap off the brisket. Then cut the brisket in thin slices against the grain. Return slices to the slow cooker and cover with sauce. Heat the meat slices on high setting in the sauce for 30-60 minutes more until sauce is hot, bubbly and thickened around the meat. Serve sliced brisket hot with sauce. Make Ahead Directions: Switch the brisket and sauce to a ceramic or glass dish. Skim fat from the surface of the cooking sauce. You may strain the sauce to separate the solids out and discard. Alternatively, you may thicken the cooking sauce by first removing the bay leaves, then using an immersion blender to blend the sauce with the garlic and onions directly in the slow cooker (careful, the liquid is hot-- protect yourself with a towel and take care with more delicate ceramic slow cooker inserts). Pour sauce over the meat in the dish. Cover with plastic wrap and place in the refrigerator. Let the brisket chill overnight, or up to two days. You can also freeze the brisket up to a week ahead if you prefer. 2 hours before serving, remove the brisket from the refrigerator. The fat in the sauce will have risen to the top, turned white, and solidified. Use a spoon to scoop the fat bits out of the sauce and discard. Take the brisket out of the dish and brush any excess sauce back into the dish. Place brisket on a cutting board, fat-side up. Slice the meat cold—first cut the fat cap off the brisket, then cut the brisket in thin slices against the grain. Pour sauce into the slow cooker and set to high heat. If you strained the sauce and didn’t blend it, mix together 1 tbsp cornstarch (use potato starch for Passover) with 1 tbsp of cold water, and stir it into the strained liquid in the slow cooker. 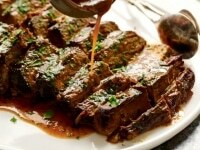 Place brisket slices into the slow cooker, cover with sauce, and reheat for 45-75 minutes or until hot and bubbly. Serve warm. 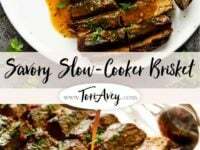 I just viewed this savory slow cooker recipe however I’ve made brisket in the crockpot with onion in the recipe which my daughter doesn’t like as well as the turmeric spice. Is their anything else that you could suggest/recommend in its place. I would greatly appreciate the help. Thanks in advance for any suggestions. 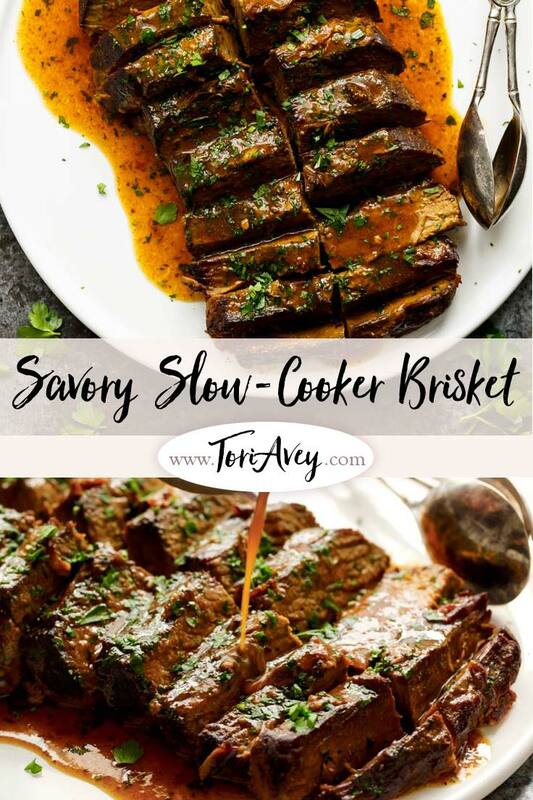 Hi Robin, all of my brisket recipes can be found here: https://toriavey.com/toris-kitchen/lets-talk-brisket/ I believe the only one that doesn’t include onions is here: https://toriavey.com/toris-kitchen/slow-cooker-barbecue-brisket/ however none of the recipes have a strong onion flavor. Nice brisket recipe, cant wait to make it, will let you know. I’m using this recipe this week for the night before Yom Kippur, a meal to sustain us. Looks like it will be delicious! I made this simple but delicious recipe with a 7 lb. whole cut, grass fed brisket for Rosh Hashanah for my husband’s family and it turned out perfectly! Three years ago I married a Jewish man of both Sephardic and Ashkenazic descent. I am not Jewish, taught myself how to cook as an adult, and have been mostly vegetarian until just a few months ago. I’ve prepared several meals for his family, finding recipes online and in cookbooks that are traditional but incorporate fresh ingredients with some modern flair. My Ashkenazic mother-in-law has been the generous cook and holiday host for the family for the past 50 years and even at her age of 82, it’s taken my dedication and perseverance to convince her to allow me to relieve her of some of the duties. The family, including my husband, are accustomed to her post-WWII era cooking style (think margarine, ketchup, vegetables cooked to a gummable consistency, jello, etc.). Slowly, I’ve been sneaking in healthier, fresher dishes. A few months ago, I prepared a well received Sephardic meal for the side of my husband’s family who are descendants of Salonica Jews, most of whom perished in the Holocaust. I am fascinated by this culture and food, all of which feel very familiar to me as I am of Southern Italian descent. This holiday, I considered it an honor and a privilege that my mother-in-law agreed to let a cousin and me to do the entire dinner ourselves. She even said, with only a little begrudgement, that she understood that it would be “different” and that she knows things change. This was huge in and of itself and it gave me the freedom to try new recipes. But I felt a tremendous amount of pressure, as you can imagine. I am so thankful for your blog as your recipes are always my first go to! With this one, I did add some tomato paste and red wine because the family is used to a sweet brisket (made with ketchup) and I didn’t want to veer too far off from the familiar. Even with the whole cut (because that is what I could find from a local farmer with high standards for humane treatment), we ended up with a very tender and clean brisket. We seared it and stuffed it in the slow cooker intact. My husband was my sous chef and helped handle to the meat since I found it a little intimidating, not to mention heavy. It cooked overnight on low for a total of 14 hours. It cut nicely, didn’t fall apart and still flaked with a fork. I couldn’t believe it turned out just right. We also made your stovetop tsimmes and, much to my surprise, my mother-in-law upon seeing it exclaimed that it was just like her mother used to make. My heart melted again the next day when she said she was bragging about the entire dinner to a friend, wouldn’t change a single recipe and would let us do it again! Her friend told her how lucky she is but I am the lucky one. It is such a joy to learn the cuisine of a culture that is new to me and to nurture my husband and his family with good food. Of course, to have a generous and kind mother-in-law is the real gift. Thank you so much Tori. Your personal story and blog give me the courage and confidence, as another shiksa, to try new things and to be a better cook. Please count me among your biggest fans! Can I use your brisket recipe with tomatoes, vinegar and brown sugar in the slow cooker? Yes, as long as you do the searing step ahead of time in a large skillet. In the past I always got flat cut briskets. I read that whole cuts ones have more flavor. I just bought a 9 lb one. Should I roast it whole or try to separate it into two pieces? Also, if it doesn’t it in my low cooker, would I be better off cutting it in half and making it in two slow cookers or roasting it whole in th oven? Hello Tori. My brisket is in the slow cooker now, and I was hoping you could confirm the amount of water. In the past, I’ve used two cups of broth with slow cooker brisket, and that seems to match other recipes online. Is 1/2 cup of water correct, or a typo? Also, echoing some of the other comments, I also don’t see a video for this recipe, though other excellent video content from your site does begin streaming. Hi Nadav, the video is just below the ingredients. You might have to wait through a short ad before it plays. 1/2 cup is correct for a first cut brisket. If you have trimmed most or all of the fat off, you might want to use more liquid. I have made this recipe many times for my family–amazing!! I was wondering thought–might you have a version of this that could be done in a pressure cooker/Instant Pot? Hi Linsey! I don’t love the way this turns out in the instant pot. I have tried it but the flavor is not quite the same. If I find the right configuration I’ll be sure to post it here! Love all of your recipes! I’m making this one right now! I’m doing a 3lb brisket tomorrow. Would the cooking time and ingredients still essentially be the same? I can not find the video anywhere. I see your other videos. Can you please help? Thank you! Hi Jennifer, it appears that it’s not visible on mobile at the moment. I have reached out to my technicians about this. Meanwhile if you load the post on desktop, you should be able to see it. I’ll get it fixed ASAP! Hi! This looks wonderful. I’m going to make this on Friday. I says there is a step by step video but I don’t see one anywhere. Where would that be located? Thanks. Hi Cindy, it’s just below the ingredient list. My slow cooker doubles as a rice cooker and does not have a “low” setting. Would I be better off cooking this in the oven in a roasting pan at 300 degrees F covered for 5-7 hours the way you described in this recipe? 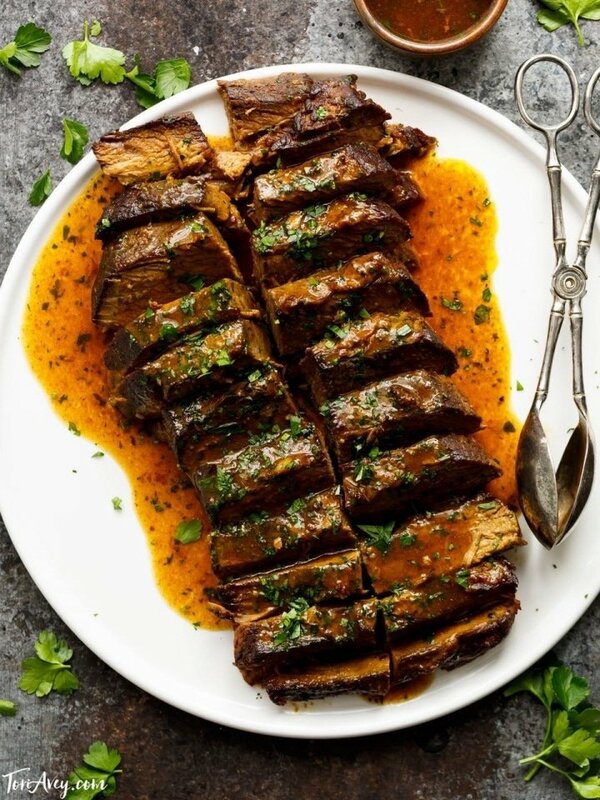 : https://toriavey.com/toris-kitchen/holiday-brisket/ I would plan to follow everything else except for the heating mechanism (oven instead of slow cooker). Yes, I would recommend oven cooking instead. Very strange that a slow cooker wouldn’t have a low setting… that tends to be the standard cook setting on a slow cooker? Regardless, the oven cooking will work just great here, but keep in mind it may take longer than 7 hours depending on the size and leanness of your brisket, so plan extra time accordingly. Thanks for your quick response! It’s an Aroma slow cooker with a rice cooker setting, so you can set it to slow cook but not to high or low. My brisket is 4 llbs, I thought an hour per llbs at 300 was the recommendation? Should I adjust that? Hi Sylvie, the slow cook setting is very likely the same as low cook on most slow cookers. If you are doing it in the oven, an hour per pound at 300 is recommended, yes– but I nearly always allow a couple of hours extra in addition the cook time, since the timing can vary from brisket to brisket. That way, if it needs another hour to get tender (due to being very lean or grass fed), it won’t ruin the whole meal. It’s very easy to keep brisket warm after cooking and before serving; or if you can make it a day ahead, even better. Thanks! One more thing- a lot of other brisket recipes that I’m coming across have a lot more liquid in them, but I really like the spice/flavor combos in your recipe. My concern- is 1/2 cup of water for a 4 llb brisket enough? Should I use more liquid if I’m putting in the oven? I don’t want it to dry out. And do you think the flavor would be enhanced or changed dramatically if I were to use beef or chicken stock? Really appreciate how responsive you are- this is the first time I’m cooking a brisket and am hosting a kosher for passover dinner with 6 friends so really want to make sure I get this right! 1/2 cup should be enough for the cooker, unless your brisket is very, very lean. The fat on the brisket melts as it cooks and creates sauce. If making in the oven, I usually add enough liquid to reach halfway up the sides of the brisket. First time I have ever made brisket. Made it for our Seder and it was devoured and people asked for the recipe. I really am not a great cook –just cook to feed my family and to entertain family when it is my turn– so it was definitely this recipe. Made the make ahead version too a tee, except I forgot to get bay leaves. When I first took it out, it seemed like it was falling apart but also a bit tough, so Inwas worried….but after sitting overnight it was fantatic and the perfect tenderness. Will definitely make this again and again….it was so easy! Tori I made this slow cooker brisket today and it was a big hit!!! Love your recipes! Thank you and wishing you a good Pesach. Very happy to hear it! Chag Sameach! My new favorite brisket recipe! Made it for our Seder and the family loved it. So easy too!! I especially love that it frees up oven space. 🙂 Chag Sameach! Made the brisket for Passover, turned out amazing. You’re right, it was very juicy and flavorful without wine. Everyone loved it and I chose to blend the sauce. I posted it in my Instagram and added your handle. Can’t wait to try some more of your recipes! Thank you! Glad to hear it April! Followed the instructions implicitly but the meat came out tough not tender, was horrible. Wasted over 8 hours and $50 to end up with a horrible meal. Seth, I’m sorry you didn’t enjoy your brisket. You mention wasting “over 8 hours.” I’m not sure exactly how long your brisket cooked, but the recipe clearly states you need 8-10 hours for cooking, and that tenderness will increase as it cooks. 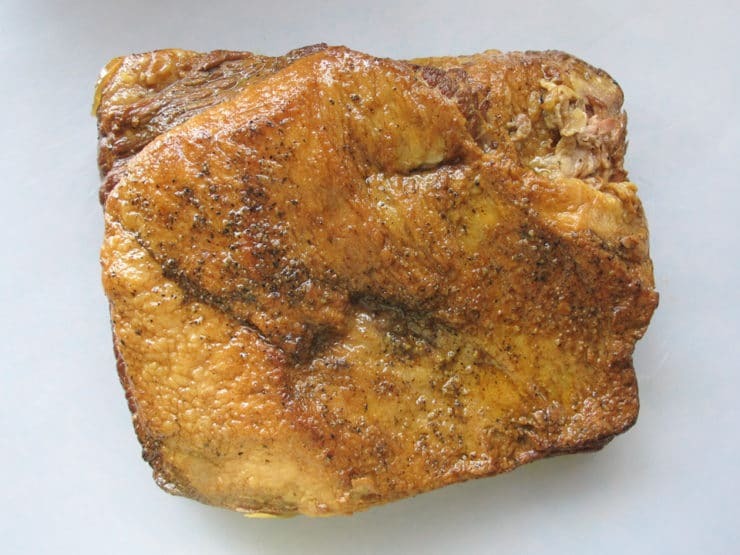 If you didn’t cook it until tender, that is not the fault of the recipe, but rather you not waiting until the brisket was fully tender— which means you in fact did not “follow the recipe implicitly.” Often it is the last 1-2 hours of cooking a brisket that makes all the difference in tenderness. If it had cooked for a full ten hours and not become tender, I would be pretty surprised… nearly every brisket will eventually get tender if it is cooked low and slow enough, even the leanest, driest cuts. For example, I made this recipe last night with a grass fed first cut brisket, about as lean as they come– and it did eventually become extremely tender, but it took over 9 hours to do so. I think the issue here is you didn’t give it enough time, or perhaps your slow cooker’s temperature is lower than average. If you still have the brisket and want to salvage it, you can return it to the slow cooker with sauce for another 2-3 hours (it will take time to get hot again which is why it might take longer than 2 hours), or in the oven in a baking pan covered with the sauce at 250 degrees F. Be sure to cook it until it becomes tender. The recipe calls for first cut brisket but in the instructions it says to cut the fat cap off. I bought first cut. Is that the right one? First cut has a fat cap too, it’s just smaller than the second cut fat cap. First cut works great for this recipe. You can actually use either, but second cut rends a lot of excess fat during cooking. I accidentally used 1.5tsp for each of the spices. Will it be much too overspiced? Any way to course correct? The cayenne too? The other ones it won’t be such a big deal, but the cayenne is SUPER spicy. Not sure how to correct for 1.5 tsp of cayenne. Oooooh, wicked late, I know, but I just put it on (just after 1 my time lol)! Hoping it’ll be cooked enough for dinner tonight!!! Haha. Service is scheduled to start around 6, 6:30, so I’ll let you know what the verdict was! I’m really glad I found your site! I’m a returnee to the Messianic way of life (after a long hiatus, so this is the first Passover I’ve ever hosted), and it’ll be nice having recipes that I can work into my meal plans! It will not get tender. I suggest trying it on high setting. Hoping for the best! I missed the stars in my previous comment! Will definitely make it again. Hi Tori, I’m a little pressed for time and wondering ifcooking it in the slow cooker on high for the first few hours might reduce the total cooking time to 6 hrs, and how will that affect the tenderness? Generally low and slow is the best way to cook brisket, but if you have no other option go ahead and do it on high for a few hours, it should be alright. Thanks Tori. I had a time crunch so did it on high for 3 hours and low for 4. It was really good, but not quite as tender as I’d have liked…. but was DELICIOUS and I will definitely do LOW AND SLOW next time. I’m sure it will be perfect! Thank you, and LOVE your site! Making this tomorrow and excited! 1: Can I leave the fat cap? 2: Can I thicken the sauce and keep the onions or blend it and add additional carmelized onions? Sorry, I was cooking my own Seder when this comment came in. For future reference, yes you can leave the fat (it’s actually preferable to have it there during cooking, I just remove it at the end because we don’t like fatty meat on the plate). And yes, you can keep the onions if you prefer. I just prefer a smoother sauce. Hope you enjoyed it! I’m making this for 4 people so I’m thinking a 2-3 lb brisket. Would the cooking time still be 8-10 hours on low or is there an adjustment? Start checking it after 5-6 hours, but it may take longer. It really depends on how lean the meat is and the actual temp of your slow cooker, so can vary greatly. Hi Tory, love your website. Was wondering if you could direct me in using this recipe in my instant pot? Thanks and happy Pesach! Hi Diane! I only recently got an instant pot and I haven’t tested this, but generally speaking for these kinds of recipes you will need less liquid using the pressure cooker function. Sorry I can’t give you more guidance! Hi can i put salt and paper the day before and leave in the fridge and then continue with the cooking? as per recipe? I’m having trouble finding the rocky road bites for Passover. What happened to the recipe. Do you prefer the blended sauce or the strained and thickened sauce? Thanks and Happy Passover! I prefer strained and thickened. 🙂 Chag Sameach! I am going to make your savory brisket for Seder this year. One post asked about marinading prior to cooking. I thought I would do this but not sure what to marinade the brisket in to compliment the spices used. Any suggestions! Thanks and Happy Passover! Hi Lori! I don’t generally marinate this brisket, it doesn’t really need it because the sauce is so flavorful. Shalom~I’m getting ready to use this recipe for Easter & wonder if I can put 2 pieces of brisket in same slow cooker. One is 1.82# and other is just over 3#. Plan to make ahead. Thanks. Thanks very much & will let y’all know results on Monday. Blessings! Great to read this, our local stores don’t carry large kosher briskets, so I bought two around 2.5 lbs each and I’m glad that someone else asked about using two! Made this for Easter and it turned out fabulous. Tender amazed. Enjoyed by everyone. This is a keeper recipe. Blessings to you. So happy you liked it Joyce! Can we use a regular blender to blend the sauce together if we do not have an immersion blender? Also – if we decide to blend the onions/garlic mixture together does this mean we do not have to strain it? Thank you! Yes, and yes– but do be sure to strain the excess fat from the sauce before blending. Making my first brisket for passover on Friday. It’s 4lbs. Would it be alright to use a little less tumeric and add some fresh rosemary and half cup of red wine (cab sauv?) for flavor? Thanks! Yes that will work– but if you haven’t made this before, I recommend trying it as written, it’s really flavorful without the addition of wine. 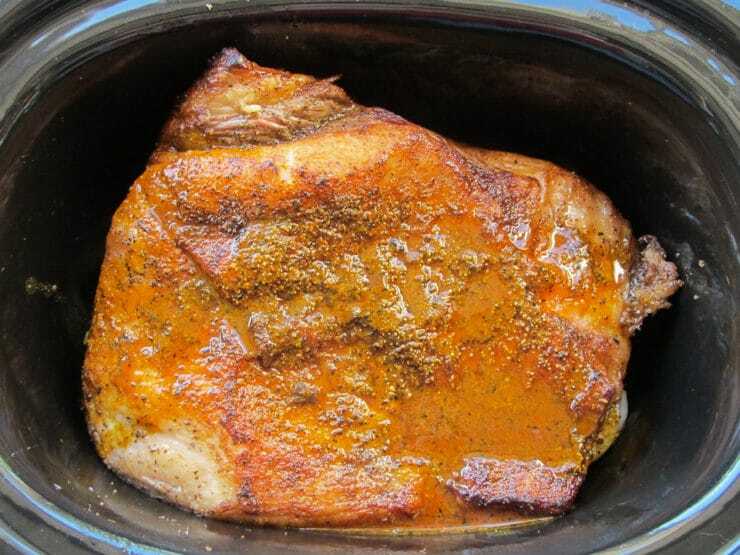 I love how your other brisket recipes have veggies cooking in with it – could I add some veggies to this crockpot version to make it a more complete meal? If so, at what point? Thank you! Hi Christie– yes, you can add carrots and celery at the beginning (they will be quite soft) or 3-4 hours in for a firmer texture. I love your recipes and want to give this a try for Passover. I only have one slow cooker, so I plan to make one brisket Thursday, and then a second one Friday. I plan to heat them up in the oven instead of the slow cooker. What temperature would you recommend for reheating in the oven, and for how long? 325 for 45 minutes to 1 hour, until hot and bubbly 🙂 enjoy! I am trying this brisket recipe for first time. It has bern in the crick pot now for 5 hrs. & is still very hard. Should I turn it on high for a little while or just leave it it looks like it will take more than 8 to 10 hours. I have 5 1/2 pounds of brisket that I cut into two separate slabs. Also I took a little bit off the end and sautéed it just to taste I know it would be tough But it was very salty. Now I’m worried that the meat might be too salty if it turns out that way what can I do to make it edible? Thank you for any help. Hi Evelyn, give it time. It really needs to cook low and slow for 8-10 hours to get tender. 5 hours won’t do it. Also as it cooks more fat will melt into the sauce, so some of the saltiness you’re tasting now will likely dissipate. That said, if it’s still overly salty you can remove the meat from the sauce and add unsalted stock or water to the sauce before you thicken. This will dilute any saltiness you might encounter. If I’m making a tiny 2 lb brisket, how many hours should I keep it in the crockpot? I can’t tell you an exact time, I would start checking it around 6 hours on low… but it may take longer. Hi Rena, just because it has come to temperature does not mean it is “finished,” in the sense that the texture will not necessarily be where it should. You should go by texture here– when the meat is tender enough to slice easily and the edges flake with a fork, that’s what you want. 3.5 hours most likely won’t produce the tender texture that is desirable here. Yes, you can freeze after slicing. Hi Tori – I am making your brisket for Passover, but have a question regarding reheating it (after a couple of days in the frig). Can I reheat it with the sauce in the oven rather than the slow cooker? If so, should I use the same time frame of 45-75 minutes – and what oven temp? Also, I want to add carrots (halved) to the slow cooker – at what point if I am cooking a 5 lb brisket (8-10 hours on low)? I would appreciate any hints/expertise you can share. Thank you. Hi Francine, yes you can reheat in the oven at 325 degrees, it may take up to an hour to reheat, you’ll need to keep an eye on it. Carrots generally hold up well to slow cooking, you can add them at the beginning and they should be fine. If you don’t want them completely soft, wait 4 hours before adding. Good luck! Hi Tori–I’m considering switching things up and trying this recipe for Passover. Just a quick question, since brisket is such a tough cut of meat, most recipes include a liquid ingredient that has acidic properties to break down the fibers and increase tenderness, like ketchup or wine. I notice this recipe does not include anything acidic. Is it just the extended cooking at low heat that makes the meat tender? Thanks! Having 18 people for Passover and want to make my briskets and freeze them. How many pounds do I need? I have 2 crockpots and can make them different days. I still have 2 weeks to go. Also can I put carrots and mushroom and potatoes in it too? Hi Sherri, I generally estimate 1/2 pound of brisket per person on holidays– while 1/4 pound is the “normal” serving size, on holidays everybody brings their appetite and it’s nice to have some leftovers. I also usually get a pound or two more in addition to that, just to be safe. So for your crowd, I’d say two 5-pound briskets should be good. You can add carrots and mushrooms; if adding potatoes, keep an eye on the liquid level, since the potatoes tend to soak up some of the juice. Enjoy! 1)My older brisket recipes use beef broth and red wine…(and a total of about three cups, including ketchup/chili sauce). I see this only asks for 1/2 cup…of water. Would subbing broth and/or wine add depth or detract from the flavor?And you’re sure this makes enough gravy/sauce? 2)I’m using kosher second-cut…and again, typically, I wouldn’t salt it because it already has been “salted”…does your recipe account for using kosher meat w respect to the salt…or should I omit? Hi JanJan 🙂 read through the comments if you’re unsure. You will see that many have made it as written with fabulous results. Slow cookers don’t need much liquid, the fat from the brisket will create plenty of sauce. If you’re using second cut this is especially true, as it has more fat and will create even more liquid as it cooks. I wouldn’t sub wine (though you can add a little for flavor if you like), as it will evaporate in the skillet faster than water. If subbing broth, make sure it’s low sodium so you don’t overdo the salt level. 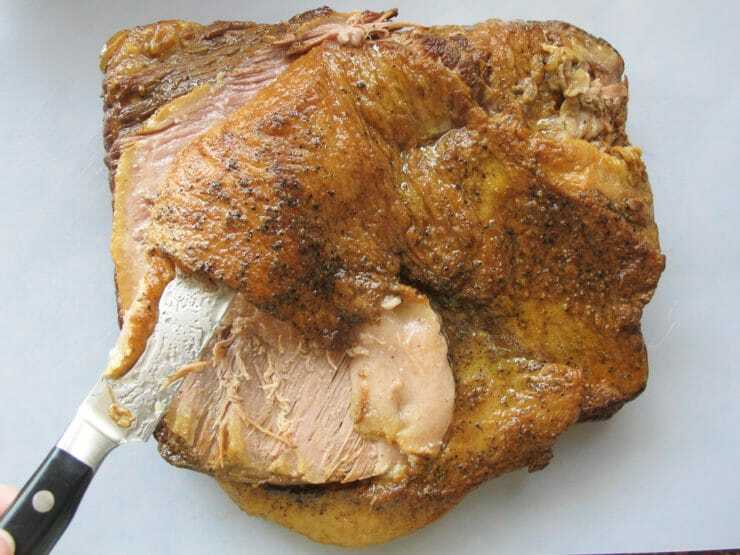 If using kosher meat, I would cut the salting of the meat step. One more tip– if using a second cut, I do recommend making this ahead using step 16’s instructions, then skimming the fat that rises to the top of the cooking liquid. Otherwise your sauce will end up very fatty. Good luck! The recipe days 8 – 10 hours, what time works best? The recipe looks amazing! Which size crockpot did you use? Hi Ana, I use a 6 quart slow cooker. Hi Tory, I am about to cook the brisket tomorrow but I do not have turmeric on hand. Is there something else I can substitute for this? You could try adding a little chicken powder, but it’s salty so you would need to pull back on the salt a bit. You can also just omit the turmeric, but it really adds to the flavor, so if you can get some it will be better. Tried this one today, very nice recipe, thank you. Was searching for a non-barbeque brisket recipe and remembered how much I loved your turkey burger recipe so looked you up again. I’ve got it bookmarked. On a cold winter day it smelled wonderful in the house and didn’t disappoint when we sat down for dinner. Nice one! Hi Yael! A 1 pound brisket will cook faster, but I don’t have an exact timing for you because I’ve never made one that small. You could probably use half of all the other ingredients, too, depending on how trimmed your brisket is– if it’s only 1 pound, I’m guessing it’s probably trimmed of most of the fat, so you’ll want to keep an eye on liquid levels as it is cooking to make sure it doesn’t dry out. Tried this recipe for Christmas. It turned out most delicious. It is my new Christmas meal. So happy I tried it. I’ve attempted different recipes for the past four years, trying to get the hang of this brisket thing for my husband’s Jewish holidays. This is a keeper! A crowd pleaser for our multi-cultural “Jewpanese” family. Thank you! “Jewpanese”– love it! So cute. Happy holidays Jennifer! Hi Tori, am about to cook the brisket and planning to freeze and take camping next week. Question? Do I pour sauce over and then freeze? Or freeze the sauce separately? Hi Mei! So sorry I didn’t get to this comment sooner, you have probably already went camping and returned by now. I was backed up with holiday comments. In future, if I were to freeze this I would do it with the sauce rather than separately. Hope it all turned out ok! Hi Desireh! I’m surprised this turned out so spicy for you, the cayenne flavor should be pretty subtle. You really must have gotten hold of a fiery cayenne. Unfortunately I was behind in answering comments and therefore your guests have already come and gone, but for any other readers who might be facing this issue, you could add some tomato puree to the sauce to dilute it a bit and counteract the spiciness. The sweetness of the tomatoes would mellow out the spice, and it would blend well with the other flavors here. Hope you found a fix! Delicious first time making with a 4 lb. brisket. Would you double all ingredients for 10 pound brisket? A crowd hit. Made this for my Hanukkah party this weekend and everyone loved it. I’m going to try this dish for Christmas day. In the make ahead directions, the reheat step: should the slow cooker be on high, low or just warm for the 45-75 minute reheat? High will reheat it fastest. Enjoy! I think I was a little aggressive when planning this and bought a a 7 pound brisket. Got through the first steps nicely but the brisket just wouldn’t fit in the slow cooker. I cut about a 1/4 off, where the large part then fit nicely and then I stacked the smaller quarter on top. Just started cooking everything, but curious if this will throw off anything, essentially having two pieces of meat stacked on top of each other? Can I put veggies in to cook with it, carrots, peas, or beans? Hi Judy, carrots and beans will work great. Peas might become mushy over the prolonged cook time, so depending on what kind of texture you like you might want to add them closer to the end of cooking. Enjoy! I just made the brisket today for the first night of Hanukkah, and it was a hit! The flavors were delicious and the meat was tender. Everyone complimented me on it. I thought I might miss a small hint of sweetness, but I didn’t. Thank you! Awesome Lauren! Happy you enjoyed it. I have two pieces of brisket that equal about 7.5 lbs (I’m increasing amounts for a party.) Can they both go in the crockpot or can I put one in a Dutch oven in the oven on low and one in a crockpot? They can both go in the crock pot if they fit in there comfortably. 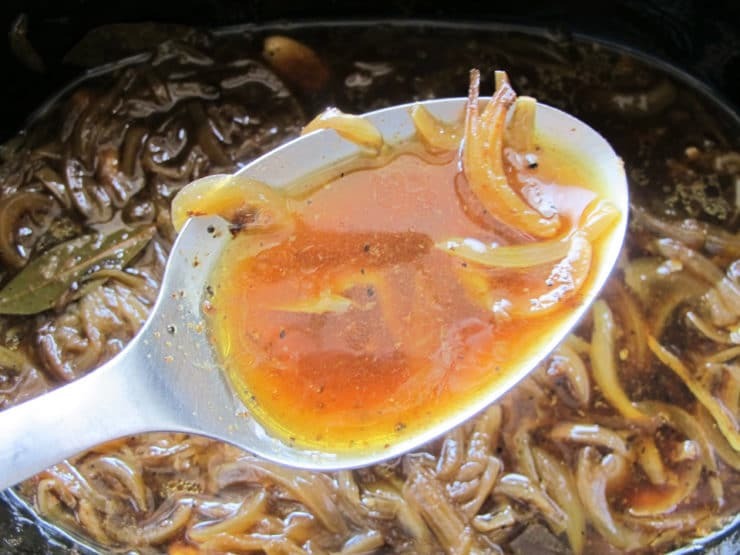 This recipe is really fantastic, especially the sauce/gravy! Tonight will be my fourth time making it. I generally use small briskest (1.5 to 2#) for my small family of four. I just reduce the garlic, bay leaves and seasoning. It’s now in the rotation of favorite dinners in my home. This is THE WAY to do brisket as I’m not a fan of the BBQ sauced variety. Do I need to adjust this recipe if my brisket is around 3.3 pounds? What about the cooking time? I made this recipe last year and didn’t save it! I just spent 30 minutes online to find it again and am so glad I did! I just wanted to let you know that it was absolutely delicious and cant wait to make it again. Thank you!!!!! I wonder why mine came out so dry. Could be that my crock pot temperature may have been too high. 10hours on low. The sauce was amazingly good so id like to make this again. Do I keep the onions with the brisket while I put it in the refrigerator? Does the sauce stay in the slow cooker during the time the brisket is in the fridge? Do you add the potato starch right before you put the brisket back in the slow cooker or do you put it in there while it waits for the brisket? Hope to hear from you soon! The sauce goes into the refrigerator with the brisket. Please read the make ahead directions carefully in the recipe above, as your questions are answered there in detail. How much water do you put as part of the recipe? 1/2 cup water, as stated in the ingredients. Looking forward to making this tomorrow. Looks delicious but not going to use that much garlic. I am planning on making this brisket for Rosh Hashanah. I’ve never made a veal brisket. I just bought it and it doesn’t have as much fat as yours does in the picture. Should I add more liquid? I hope you answer me soon, as I would like to cook it in the next day or so. Can’t wait to try this! Shanna Tova!! Hi Shelley– I have never cooked veal brisket, unfortunately, so I don’t have any advice for you on this. I usually use first cut traditional brisket. I have made this before and really liked it. This year I am thinking about making it ahead and in the directions you mention to transfer it to a ceramic dish to store in the refrigerator for 1-2 nights, however, isn’t the base of the slow cooker ceramic? Wondering if I can keep it in the slow cooker base in the refrigerator? Thank you! Hi Laura, Tori’s assistant Ashley here. You can use the slow cooker base as a container for the refrigerator if you’d like. It just takes up a lot more space than a ceramic dish. I do hope you answer soon. Hi Chana-Rochel, Tori’s assistant Ashley here. 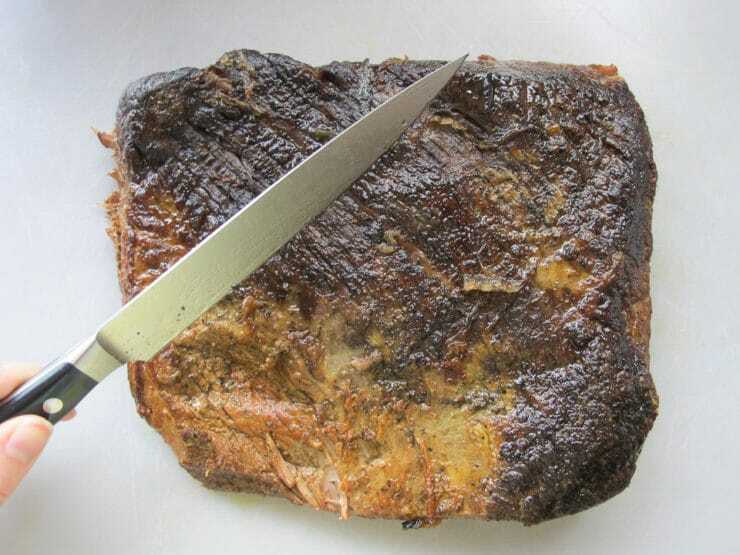 I’m not sure I’ve seen a brisket that has been cut that way. It sounds more like what we would call a roast here. I think it would be fine to follow Tori’s instructions, just be sure that you cook the brisket until it reaches an internal temp of at least 175 degrees F and is fork tender. You may want to check the level of liquid a few times during the cooking process to make sure the brisket isn’t burning. If the liquid runs out you can replace it with water or beef broth. Hope this helps! Used this recipe for the first brisket I ever made. It was perfect. Trying it today for the first time. Went through many recipes on the net but yours sounded the best and really appreciate the instructions with photos. Have done everything according to the recipe except I added some curry powder to give it my favourite East Indian spicy flavour. Now have to wait to see how it all turns out. Will report back. Again, thank you for the great recipe. My husband and I visited Israel for the first time a few weeks ago. After coming back I was looking for a recipe of an egg dish I had and loved it and found it on your website ~ shakshuka. I’ve yet to make it. Although I did make your brisket for Easter and my son-in-law loved it! And we’re making it again for our grandson’s birthday party this weekend. Looking forward to making more of your recipes. And thank you for explanations/stories of Jewish culture. I loved Israel and look forward to visiting again. Made this for Passover. Came out delish! Only thing, I think about a 1/2 – 1C of Honey would add some nice sweetness to this. Made my first brisket, this turned out so delicious. Thank you!